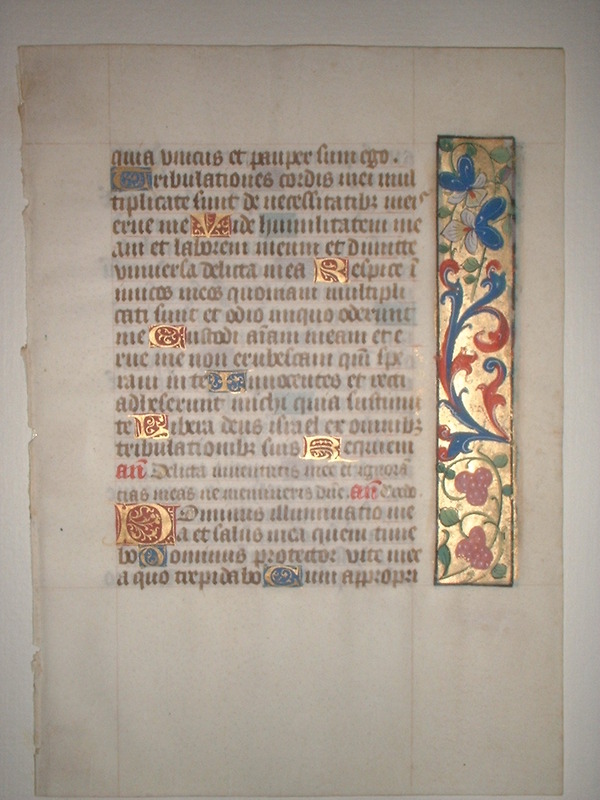 Text: This leaf contains the Office for the Dead at Matins, the Second Nocturne (here, Psalms 42 and 46). Reconstruction Note! 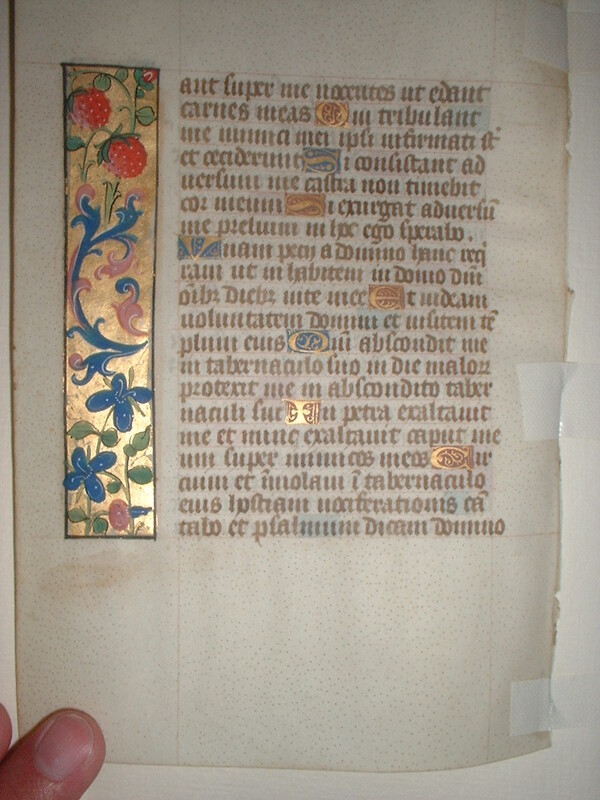 In Ege's original manuscript, this leaf followed what is now Leaf 48 in the Cleveland Public Library portfolio, and was followed by what is now Leaf 48 in the Rochester Institute of Technology portfolio. quia unicus et pauper sum ego. Tribulationes cordis mei multiplicatae sunt: de necessitatibus meis erue me. Vide humilitatem meam, et laborem meum: et dimitte universa delicta mea. Respice inimicos meos, quoniam multiplicati sunt: et odio iniquo oderunt me. Custodi animam meam, et erue me: non erubescam, quoniam speravi in te. Innocentes et recti adhaeserunt mihi: quia sustinui te. Libera Deus Israel: ex omnibus tribulationibus suis. Requiem. Ant: Delicta iuventutis meae et ignorantias meas ne memineris Domine. Ant: Credo. Dominus illuminatio mea, et salus mea: quem timebo? Dominus protector vitae meae: a quo trepidabo? [Psalms 24] because I am alone, and poor. The tribulations of my heart are multiplied: deliver me from my necessities. See my humbleness, and my labour: and forgive all my sins. Behold mine enemies, because they are multiplied: and with unjust hatred have hated me. Keep my soul, and deliver me: I shall not be ashamed, because I have hoped in thee. The innocent and righteous have cleaved to me: because I expected thee. Deliver Israel O God: out of all his tribulations. Eternal rest. Ant: The offences of my youth, and my ignorances remember not O Lord. Ant: I believe to see. -ant super me nocentes: ut edant carnes meas. Qui tribulant me inimici mei: ipsi infirmati sunt, et ceciderunt. Si consistant adversum me castra: non timebit cor meum. Si exurgat adversum me praelium: in hoc ego sperabo. Unam petii a Domino, hanc requiram: ut inhabitem in domo Domini omnibus diebus vitae meae. Ut videam voluntatem Domini: et visitem templum eius. Quoniam abscondit me in tabernaculo suo: in die malorum protexit me in abscondito tabernaculi sui. In petra exaltavit me: et nunc exaltavit caput meum super inimicos meos. Circuivi, et immolavi in tabernaculo eius hostiam vociferationis: cantabo, et psalmum dicam Domino. [continues Psalms 26] ...upon me: to eat my flesh. Mine enemies that trouble me: themselves are weakened and are fallen. If camps stand together against me: my heart shall not fear. If battle rise up against me: in this will I hope. One thing I have asked of our Lord, this will I seek for: that I may dwell in the house of our Lord all the days of my life. That I may see the will of our Lord: and visit his temple. Because he hath hid me in his tabernacle: in the day of evils he hath protected me in the secret of his tabernacle. In a rock he hath exalted me: and now he hath exalted my head, over my enemies. I have gone round about, and have offered in his tabernacle an host of loud crying: I will sing, and say a psalm to our Lord.